Dubai is at the centre of one of the fastest growing economies in the world, and boasts a hugely successful residential market that has attracted millions of professionals and investors over the years. The city is home to a growing population of affluent home owners and residents, looking to maintain a modern and stylish lifestyle within world class property developments. As this market continues to grow, it is expected to create an unprecedented demand for lavish and upmarket home interiors over the next decade. This entry was posted in Events and tagged Dubai, Festival, Trade Show on February 25, 2016 by Chuck Gregory. Established over 20 years ago, Gulfood has a well-deserved reputation within the food and hospitality industry, delivering spectacular returns on investment. Under the theme ‘International Flavours, World Class Business’, Gulfood 2014 provided a vast trade and sourcing platform for exporters, buyers, exhibitors and visitors alike, as well as hosting a number of lucrative networking opportunities, competitions and live events. 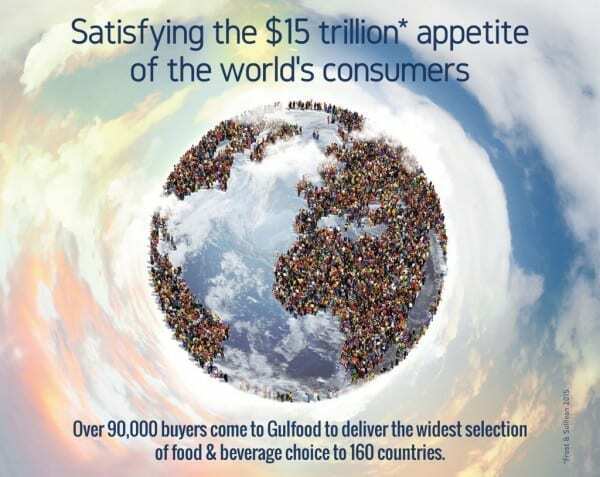 Gulfood has become the global hub for the highest quality F&B products and a trusted partner worldwide. As the world’s largest annual food and hospitality show, Gulfood is where the latest tastes, trends and innovations are unveiled. It’s where the global food industry meets to trade, so you can benchmark price, quality, service, reliability and consistency. More than 114 country pavilions. This entry was posted in Events and tagged Beverages, Dubai, Festival, Food, Trade Show on January 7, 2016 by Chuck Gregory.